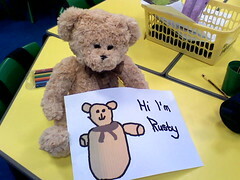 Rusty arrived all the way from Folkestone to find all the children were out at ICT with Mrs Tonner. Mrs Mooney looked after Rusty until all the children came back and what a surprise they got to find Rusty in their classroom. Rusty is having a great time at The High School of Dundee. He loves playing with the children, but best of all, he likes using the computer to draw pictures. We're so glad that Rusty is safe in Dundee. How many friends does he have? Would you like to send us a picture of Rusty using the computer.